When she cut her viticulture degree short and moved home, Remy wasn’t thinking about anything more than making the next dollar for her pocket. Working two jobs to keep food on the table and a loan shark from the door, Remy and her mother slowly build a new life together. Then a freak storm tears through the Margaret River Wine Festival — and Seth Lasrey tears through Remy’s life. Remy is Seth's employee and he absolutely should not be making moves on her, especially with that pesky workplace relationships memo he's been so keen for everyone else to follow. But he can't pass Remy by and they fall hard and fast for each other. Before their relationship has had a chance to blossom, however, Remy has fled his life without a word. Five years later, Seth finds Remy once more and finally has the chance to prove how good they could be together and to work out why she disappeared so suddenly. Seth is a workaholic, more focused on the next acquisition than having fun. Remy takes her work seriously too, but she has had to make sacrifices in her attempts to pay off her late-father's debts and to support her mother. She's a down on her luck heroine, but this isn't an angsty read, mostly thanks to Remy being a lot of fun. Even while drama unfolds, she helps Seth see the lighter side of life. It's far from easy sailing for these two, even once they reunite, as the two must contend with the drama of Seth's mother, as well as his conniving colleague Rina, both of whom are out to destroy Seth and Remy's relationship for their own selfish reasons. There's lots of drama! This is my second Lily Malone novel, after my first, Fairway to Heaven. Other than both being Aussie rural romances, the two novels are extremely different. Both are as fun as each other to read, and Lily Malone's quirky yet subtle sense of humor is present in both books, but it's much sweeter in tone than the slightly cheekier Fairway. 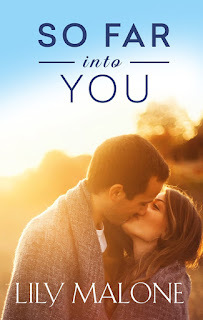 I also think So Far Into You is probably a little more accessible than her earlier novel, but Fairway will always be one of those books that holds an extra special place in my heart. After only two of her novels, I'm coming to realize Lily Malone laughs in the face of my expectations of romance novel structure, and I need to start trusting that she has her reasons. In the case of So Far Into You, I have to admit I groaned a little when we flashed forward five years. Remy and Seth meet and fall in love in the first section of this novel and reunite in the second. But despite my goldfish-like attention span and inability to handle narrative time-jumps, So Far Into You wooed me back! The jump forward in time, which by all rights should have broken the cohesion of the story, not only worked well, but provided an opportunity to see and understand the development of Remy and particularly Seth as individual characters, outside their relationship, only making the romance itself feel more true and honest when they finally come back together again. Seth is quite patronizing at the start, but develops into a total sweetheart after his encounter and temporary loss of Remy; while Remy herself is initially overly conscious of her lack of money compared to Seth's wealth, and yet develops into an assured independent character. These shifts in their personality were convincing with the five year jump, and made the romance so much more than the falling-fast-fling that developed at the start. Having Remy and Seth grow up allows us to get a believable and quite adorable romance that also manages to be compelling (even for the goldfish amongst us). So Far Into You is a sweet rural romance, with a millionaire, family drama, and wine. What more could you want? So Far Into You by Lily Malone is a contemporary romance, released by Escape Publishing on October 22, 2015.